With the support of Association Building Community, we'd like to propose a next phase for the Art of Peace...Aikido 2.0. 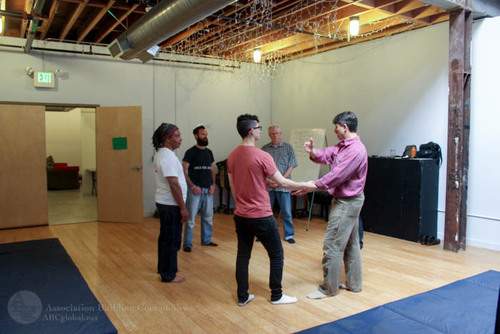 Begin with traditional aikido body movement learned in silence, but incorporate language and thought explicitly, on the mat, as soon as the basic movements are clear. Anyone can do this and call the terrain they are exploring Aikido 2.0. Conflicts are always both communicated (ideas linked by language) and somatic (embodied). Both movement and words form the gateway to aligning action and intention. Practice is the only way to be able to use both movement and communication under pressure, such that conflict itself changes to reflect more humane expectations. As the founder of aikido made clear, the purpose is not to throw down some opponent but to transform conflict in the world. Why not practice that in every dojo, at very least? Why not in every family and organization? Instead, the next step in the direction the founder of aikido intended: changing the world beyond the dojo for the better by changing how conflict works. When you are ready, learn with us beyond Aikido 2.0, through improvisation and facilitation skills, to become a conflict professional. Practice Martial Nonviolence and become a Peace Practices Instructor through Association Building Community.